Despite persistent calls from dentists to brush and floss regularly, more than 30% of adults develop cavities. While you can’t do anything about the cavities you already have, you can help stop future dental problems. Using a good quality toothbrush and replacing it regularly helps. Mouthwash can also prove beneficial. Let us not forget flossing. Flossing is one of the most overlooked aspects of dental care, which is unfortunate. The benefits of flossing are many and varied. Let’s take a look at top five benefits. One of the more common dental conditions, gingivitis affects the gum. When you floss on a regular basis, it helps remove the plaque that builds up along your gums. That, in turn, helps prevent gingivitis. Brushing your teeth works really well at knocking loose food particles and plaque on the surface of your teeth. Brushing can’t do much about the food particles that end up between your teeth. This proves especially true if you have closely packed teeth. Flossing helps pull those particles free. It also makes it easier for water or mouthwash to rinse between the teeth. The extra few dollars you spend on floss and the few minutes you spend on flossing can yield substantial health benefits. Compared with the expense and reduction in quality of life associated with those conditions, it’s a small price to pay. Almost everyone has a bad breath day. Maybe you ate that onion bagel on the way into work or just didn’t take your time brushing. One of the big causes of bad breath, though, is food particles decaying between your teeth. Flossing knocks them loose and helps ensure your breath smells good every day. Many people get porcelain veneers for cosmetic and practical purposes. Veneers can make your teeth slightly longer for a solid bit. They can also help cover discoloration or slight unevenness. They will start to break down the way natural enamel breaks down without the proper attention. Flossing helps protect your veneers the same way it protects your teeth. There are many benefits of flossing beyond simply prying loose a bit of popcorn kernel. Although, that is often a welcome benefit. It makes brushing and mouthwash more effective. It keeps your breath smelling fresh. Flossing also helps preserve your veneers, making them a better long-term investment. You also enjoy several health benefits. Flossing helps protect you from basic tooth decay and gingivitis. It also reduces the odd of other health problems associated with tooth problems and gum diseases. Eccella Smiles offers a full range of dental services, from general and cosmetic to restorative dentistry. For questions or appointments, contact Eccella Smiles today. Flossing is one of the most important habits for maintaining excellent oral hygiene. It helps clean your teeth and protects your gums from the nasty diseases caused by plaque. But if you have braces, you may find regular flossing to be a challenge. But don’t stress! We’re here to help walk you through it. 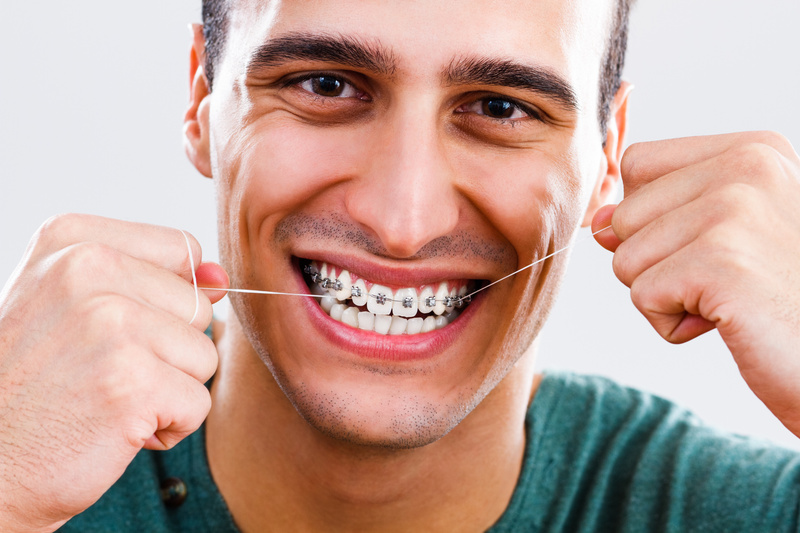 Keep reading to learn all about flossing with braces and how to get it right. Let’s get started! Which Flossing Tools Are Best? Before you get started, it’s important that you select the right kind of floss. Look for a waxed dental floss or an option that advertises a smooth glide. If you have braces, floss can easily catch on the metal components. Wax will reduce this risk. If you prefer to use dental flossers for ease, look into purchasing a water flosser. These are the most effective kind of flossers for braces. A floss threader won’t help because you won’t be able to get it past the wire component of your braces. Once you have the perfect floss, it’s time to get started. Start by cutting off a piece that’s big enough to comfortably wrap around both hands. This will give you control while you’re getting the job done. Once the floss is successfully threaded and can move freely, you’re ready to pull the floss in between whichever two teeth are nearest. Hold an end of the floss in each hand and slide it between the teeth. Use the floss to scrub the space in between your teeth. If it feels like a tight squeeze, don’t worry, that’s totally normal. While you’re flossing, keep in mind that you aren’t just removing food debris. You’re also removing plaque, which can be hard to see. So, even if you don’t feel like you’re helping, you are! If you’re lucky enough to have Invisalign clear aligners to straighten your smile, flossing is a breeze. Because Invisalign is removable, you can floss like normal. But keep in mind that brushing and flossing should be a more frequent part of your daily routine if you wear aligners. Instead of brushing and flossing once in the morning and once at night, you’ll need to complete these steps after every meal or snack. Otherwise, the food and bacteria will get trapped in the aligners and cause damage to your teeth. And for the best results, remember to floss before you brush. It helps make the whole process more efficient. 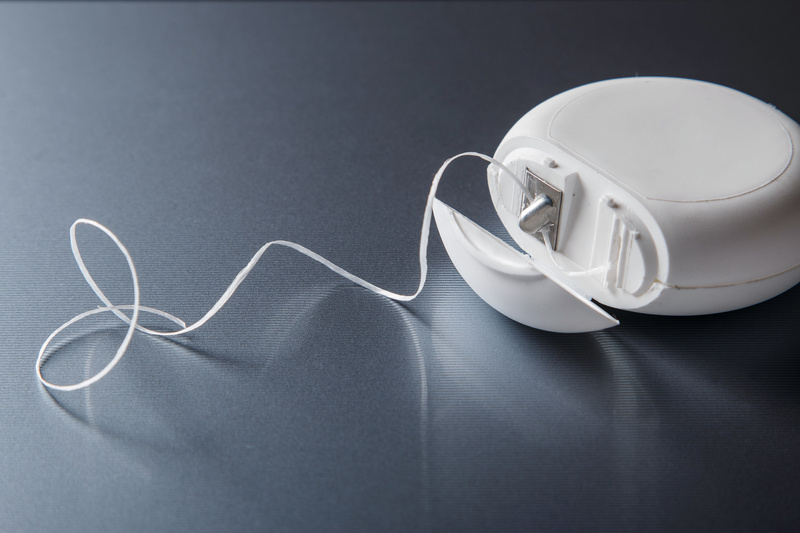 Flossing with braces can feel like a challenge. But if you use the tips above, you’ll be flossing like a pro in no time. By regularly removing food debris and plaque from your teeth, you’ll keep your mouth clean and protected. Just remember to buy a waxed floss if you have wire braces, and to floss after every meal if you have Invisalign. If you have any questions about dental care or would like to know more about our services, don’t hesitate to ask. Contact us anytime and we’d be happy to help. Nearly half of all adult Americans are suffering from some form of periodontal disease (gum recession). For many of these cases, a gum graft surgery is needed to help reduce the damage. Read on to learn more about gum graft surgery and what can be expected from the procedure. Gum graft surgery is a dental procedure that’s used to help reduce or reverse gum recession. While the name may be intimidating, the procedure is relatively quick and straight forward. During the procedure, the periodontist will use pieces of healthy tissue that has been collected from the roof of the mouth to help create new tissue where the gums have declined. 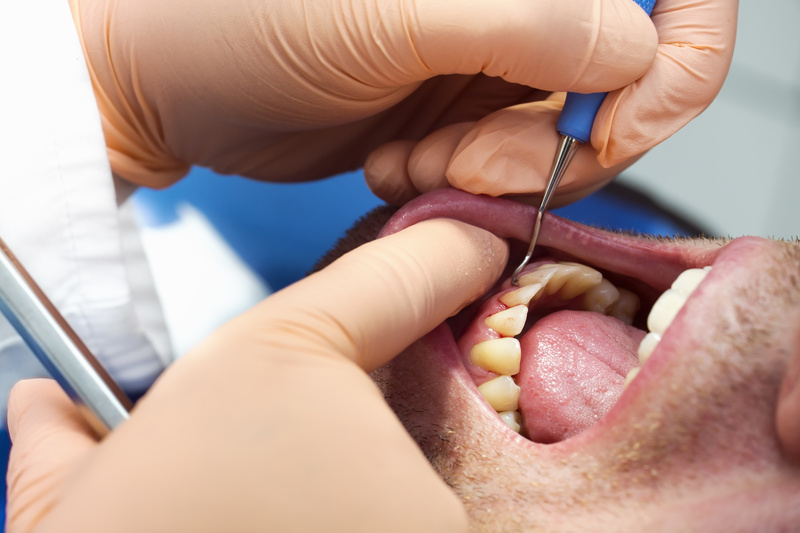 There are various ways for a periodontist to complete a gum graft surgery. They can complete the process through connective tissue grafts, free gingival grafts, or with pedicle (lateral) grafts. 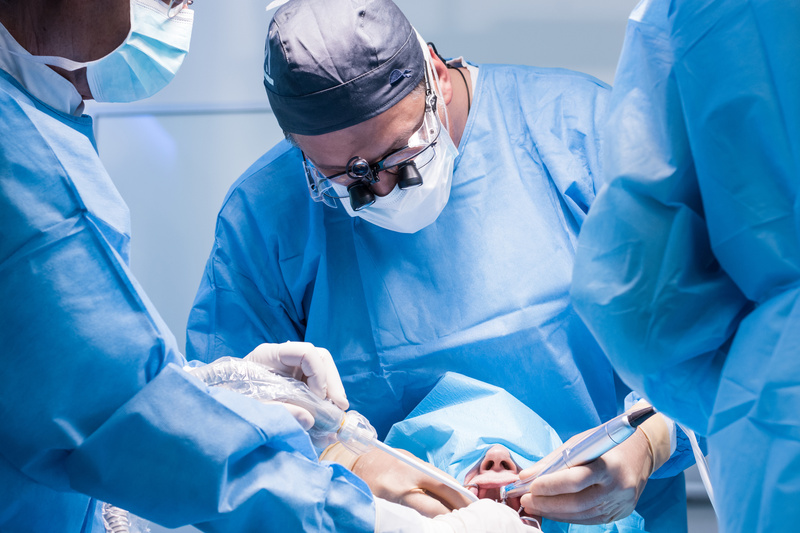 While each procedure varies in technique, all of them involve the use of healthy tissue being removed and placed where the receding gum tissue is occurring. The type of procedure the periodontist uses will depend on the severity of the gum recession and the amount of available healthy tissue. With any gum graft surgery, the periodontist will first use an anesthetic to ensure the patient does not feel any pain throughout the procedure. Who Should Get Gum Graft Surgery? Whether or not a gum graft surgery is actually necessary will depend on the severity of the gum recession. Typically, the surgery is reserved for progressed cases of gum recession. The further along the gum recession, the higher the likelihood of tooth loss. What makes gum recession particularly difficult is that few notice it even occurring until it’s too late. If you are able to catch the gum recession early on, a gum tissue graft may not be needed. However, in most cases, it is highly recommended. There are several factors that will determine the final cost of your gum graft surgery. The first is how severe the gum recession is and the type of gum graft surgery method that will be required. The second is whether or not you have dental insurance and if that dental insurance will cover part or all of the procedure. Your dental office will usually be able to provide you with a quote prior to the procedure taking place. Since gum graft surgery in a minimally invasive procedure, the recovery time is generally quick, only take a couple of weeks to fully heal. However, there are some actions that can be taken in order to speed up recovery. First, be sure to use antibiotics to help reduce the chance of an infection occurring. You’ll also want to stick to foods that are soft and easy to eat, such as pasta, cheese, or ice cream. Finally, it’s recommended to use a special mouthwash and to avoid brushing or flossing near the graft. Gum graft surgery is a smart choice to help reverse the damage of gum recession. However, there are steps you can take early on to keep the recession from occurring in the first place. Be sure to brush and floss your teeth each day and to make regular visits to your dentist to keep your oral health at its best. Comments Off on What is Gum Graft Surgery? According to the CDC half of American adults have gum disease. If this were any other disease, this would be considered a national health emergency. And yet, people don’t take periodontal diseases as serious as they should. If you’re debating whether or not you should visit a periodontist, here are 6 telltale signs your mouth is your begging you to go. Do your gums bleed when you brush or floss your teeth? Many people deal with this issue, and it’s indicative of poor gum health. Bleeding means that plaque buildup has inflamed your gums and made them more sensitive. It may not be serious, but it at least means you’re due for a cleaning…and better dental hygiene overall. People have their own ideas about where bad breath comes from, but the fact is that it comes from a buildup of harmful bacteria in your gum tissue. If you suffered from chronic bad breath that all the mints in the world can’t fix, this is likely your problem. Are your roots showing? It’s a much more serious problem with teeth than it is with dyed hair. If you’ve noticed your gums are covering less of your teeth over time, this is the result of plaque buildup. This is, again, a result of poor hygiene and irregular periodontist visits. Of the three symptoms we’ve mentioned so far, this is the most serious. Try to make an appointment immediately if you’re experiencing gum recession. Healthy gums should be an almost bubble-gum pink and be stiff and firm. If your gums are sore to the touch and feel soft, you’ve likely got an advanced case of gingivitis. This is as serious an issue as gum recession, as one leads to the other most of the time. Do your teeth hurt when you drink hot or cold liquids or eat ice cream? Does a cold wind at your face make your teeth ache? This is as a symptom of exposed teeth roots. This happens when your gums recede all the way to your bottom of your teeth. So in case you haven’t notice your gums receding, this symptom should tip you off. If you have loose teeth and you’re over the age of 18, odds are that it isn’t the result of your grown-up teeth coming in. As an adult, loose teeth is a symptom of pockets of bacteria forming around the roots of your teeth in your gums. As the bacteria grow, the bone and connective tissue deteriorate, making your teeth fall out. Ready to Schedule an Appointment with a Periodontist? This article wasn’t meant to scare you, but to alert you to the serious consequences of putting your gum health on the backburner. If you’d like to schedule an appointment with a periodontist, be sure to contact us via phone or email. We’ll help you get your oral health back into tip-top shape! Two things are certain when it comes to your mouth. One, it’s best to keep it healthy. Two, it can be frustrating when you aren’t exactly sure what’s going on (or how to fix it). Take bleeding gums, for example. Unlike say, a cavity or mouth sore, your gums could be bleeding for several different reasons. Perhaps it happens at different times, like when you’re flossing or even while brushing. If your gums are bleeding, though, you probably want to know what’s up. Here’s why. Gingivitis is a common form of gum disease that can lead to inflamed gums or gums bleeding. Plaque builds up on your teeth and irritates the gum tissue, which leads to inflammation. Like any type of inflammation (consider of a bruise), blood is never far away, because it’s working to heal the tissues. Therefore you may see redness or swelling in your gums from gingivitis. Again, it’s very common to have gingivitis. But you want to get it taken care of. Brushing twice a day and some light flossing will help, but it could take up to two weeks before you notice results. Emphasis on light flossing, and don’t be surprised if they bleed even then. The cure for gingivitis could be the cause of your bleeding or sore gums. There is an art to brushing your teeth, and if you haven’t mastered it, your gums may be suffering. It starts with the right toothbrush and toothpaste. A brush with really hard bristles may irritate your gum lining and damage it, which can lead to some bleeding. Don’t buy into the idea that the harder you brush, the cleaner your gums will be. You also need to replace your brush every few months. If the bristles are worn down or frayed, they aren’t getting into the nooks and crannies of your teeth, which can lead to gingivitis. Are you one of the 32 percent of people who report never flossing? We hope not, but if you are, that might be why your teeth are showing signs of gum disease. Flossing doesn’t just improve your smile, but the overall health of your mouth and gums. The amount of blood coming out of your mouth at first might not make it seem the healthiest act, but trust us, it is. Flossing regularly will help remove plaque building up in your teeth and over time make your gum lining stronger and healthier. It will also reduce the bleeding, even if there is more blood when you first start doing it. There are several things that can cause bleeding gums, but most of them are wholly within your control. Treat your gingivitis if you have it, and practice better and more consistent brushing and flossing technique. Your smile and gum health will thank you. Learn more about our dental services. From implants to cosmetic surgery, we can help you turn that frown upside down—and then show it off! Comments Off on Why Are My Gums Bleeding?